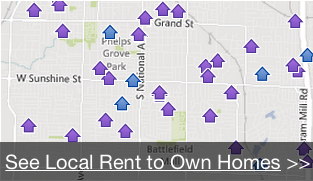 What type of people do a rent to own? In most cases, a rent to own agreement combines the benefits of Leasing and Owning a home . You’ll have a Lease as well as an Option to Purchase the home. It’s often called a lease with an option – or a lease/option agreement for short. The option in the contract gives you the right to purchase the property for a set time period – usually around 1-3 years. This gives you the ability to save money towards a down payment, repair credit, increase your income, or otherwise improve your ability to qualify for a mortgage. Either way, you need a roof over your head, so why put all your money into someone else’s pocket? First, we need you to complete the Rent to Own Buyer Profile (just takes 1-2 minutes after inputting your name and email address). This just tells us more about your income, credit, money available, monthly budget, location, etc. so we are able to distinguish which of our programs works best for you. Then, we’ll get you into one of the properties you’re interested in OR set you up on our Home Finder program. Once you’ve seen one of our fantastic properties, we’ll give you an application to fill out. Don’t worry – we help people with all kinds of credit and financial situations, and if you can afford the property, we can probably help you to own it. After you’re approved to rent the property, just sign the lease and option agreement, pay your security deposit and Option Fee, plus first months’ rent – then move on in! We typically close with a local title company or attorney so you know you’re working with industry professionals. We work with some of the top local lenders and credit enhancement companies who understand people like you and your situation! First step – sign up to find great properties around Minneapolis - St. Paul just by filling out the form. Yes you can! Many people with bad credit can still get a rent-to-own home. We practically expect it. Even if your credit is bad, you can still own a property! We’ve helped many folks who have been through a foreclosure, bankruptcy or short sale due to a past situation that is still causing them to be in a financial “black hole” and unable to get a mortgage. Try before you buy! You get to live in your rented home before you actually purchase it, allowing you to make sure it’s actually your dream home. If you don’t like the house, you don’t have to complete the purchase. (You may forfeit your Option Fee in this case). You don’t have to have a down payment until you technically purchase the home with a mortgage (typically 3 years or less). However there is an amount due upon move-in and execution of the option to purchase agreement called an Option Fee. You are paying for the right to buy the home at a set price in the future IF you want to (but you’re not obligated to). This Option Fee is non-refundable if you choose not to purchase the home. Just like any other lease agreement in Minneapolis - St. Paul, there may be a security deposit and a small application fee in addition to the fee upon move-in . Of course, you’ll have to pay rent each month. A lot more than you might think! Since the financial crisis, it has gotten much tougher to get a mortgage! Even with good credit or a good job, people are still getting denied for a home loan, forcing them to waste all their money on rent! Many folks who are Self-Employed, newly employed, haven’t been on a job for 2 years yet, new to commission or bonus income, folks who’ve had a bump in the road due to unexpected medical issues, divorce, job loss, taking a chance on a new business that didn’t work out, or those who just didn’t have a good money coach on their side but now are ready for a change! There are many things that can stop you from getting financing and since our team has over 15 years in the mortgage business and work with some of the top lenders in the country, we can help give you a road map to get to where you need to go during your Rent to Own time frame! We’ll conduct a credit check and verify the income(s) for everyone over 18 who is living in your household to confirm that you’ll be able to make your monthly payment. There is also a background check and eviction check as part of the process. You will be paying all utilities and responsible for all the lawn care and snow removal, just like you are on your own home.